Which room-in-a-box should I buy? All of them, of course! Oh, you want to know which you should buy first? Fair enough then. The Werewolf Experiment is my personal favourite, though you may need to wait for Mattel’s version of it to hit the market before you can get a copy. Unlock! is a really well-designed set of games, despite being too trigger-happy with time penalties. 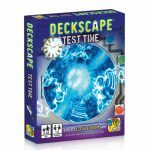 For an easier story-driven game, try one of the ThinkFun games or (particularly if you want a portable option) Deckscape. 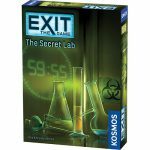 For a challenge, try KOSMOS Games’ Exit series. 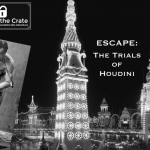 Escape The Crate will give you a game every two months on a subscription basis. 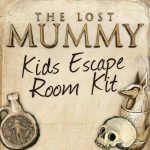 For escape room parties, especially for customisable or kid-friendly / teenager-friendly options, check out Lock Paper Scissors. iDventure also provide customisable games which can be bought on a print-and-play basis or in physical form. 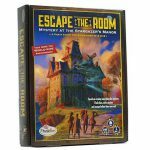 For something you can play solo while travelling with no time limit, take a look at the book games from Escape From The Room and Ivan Tapia. 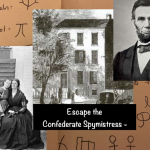 For a special occasion, consider the rent-a-suitcase games from Abducted Live, Red House Mysteries or Escape Game Products, or one of the many mobile escape games. For full details of the main games commercially available in English, see below. Cost: Around £15 per game, sold individually. Players: Officially 3+, 1-3 recommended. Length: 60 mins per game, with a time extension for the final puzzle. Replayable? : Yes, with instructions for packaging it back up again. Components may suffer on repeated play. Buy this if: you want a more moderate difficulty level, or like a good amount of story text. Stargazer is easier, Dr. Gravely has a darker storyline and some physical entanglement puzzles. Cost: Around £13 per game, sold individually. Players: Officially 1-6, 1-3 recommended. Length: 60 mins per game, but can easily take longer unless you do very well! Replayable? : No (unless you take great pains to avoid marking or damaging the destructible sections). Buy this if: you want clever, challenging puzzles. My favourites were Secret Lab and Forbidden Castle, but the quality is fairly consistent across all of them. 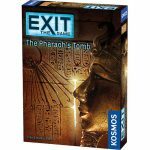 Cost: Around £27, sold as a single box of three scenarios; or $15 per game individually in the US. A selection of shorter games are available for free print-and-play. Length: 60 mins per game, with time deducted for mistakes (30 mins for print-and-play games). 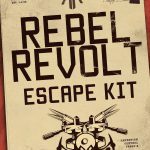 Buy this if: you want an all round good set of card-based escape games; try the free downloads to get a taste, though the full games are superior. Cost: Around £50, sold as a single box of four scenarios; expansions are sold individually, at around £8 each (though you may also need to pay shipping from the US). Players: Officially 3-5, 1-3 recommended. Length: 60 mins per game, with a small time penalty for mistakes. Buy this if: you like the cool decoder gadget, and don’t mind that some of the puzzles are tenuous. For favourite scenario in the base set, we were split between Virus and Aztec; the Welcome to Funland expansion is comfortably better than either. Cost: About €11, though international shipping adds a lot to that – UK price may be as much as £24. Buy this if: you want a lighter card-based game with accessible mechanics, observation-based puzzles and a decent narrative. 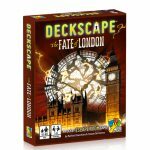 Test Time is straightforward, Fate of London is tougher with some very clever puzzles but also a couple of dubious ones. Players: Officially 2-8, 1-3 recommended. Buy this if: you can get hold of a copy! Cost: $29 per game as part of a subscription, $39 for a past game; outside the US, international shipping adds quite a bit to that. Players: Unspecified, but 1-3 recommended. Length: 60-80 mins per game, depending on your preferred difficulty level. Replayable? : Yes; reset instructions included. A few components are designed to be written on, but replacements can be printed. 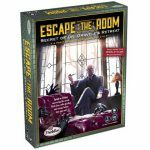 Buy this if: you want to give yourself (or someone else) a steady stream of escape games, and if you can bear the price once shipping charges are added on. Players: One or more teams of around 4, potentially many teams if you print multiple copies. Buy this if: you don’t mind print and play, and if you want something customisable, or for a larger number of players, or for kids / teenagers. Players: Officially 1-4, 1-3 recommended. Length: 60 mins per game. Buy this if: you like the sound of a game where the first puzzle is identifying the puzzles. Cost: €15-25, plus printing or postage costs. Players: Not specified, we recommend 1-3. Length: 120 mins per game. Replayable? : Fairly easy to play without marking components. Buy this if: You’d like a solid, medium-difficulty puzzle game. Buy this if: you want a book-based game and you’re not planning to play the London game it’s based on! Replayable? : Mostly (one puzzle uses a destructive mechanic, but you can work around it). Buy this if: you want a book-based game for solo play with no time limit. Players: “Groups of 4 to 16 people, played in teams of 1, 2 or 3”. Length: 45-60 mins per team. Buy Rent this if: you’re close enough to Exeter to collect it and are not put off by the cost! Buy Rent this if: you want a relatively affordable option for a suitcase game. Players: Officially 1-2, 1-2 recommended. Buy this if: you want something cheap and quick, and you’ve already played Journal29. Is there anything else I can play? Those are all the play-at-home escape games currently available in the UK that I’m aware of – with the exception of Escape Team, who have a series of short print-at-home games currently on beta release. The Armchair Detective Co ran a successful crowd-funding project, and have a set of three games currently under production. They look like they’ll be high end games with very impressive components, though that means they may be prohibitively expensive, especially for those outside the US. 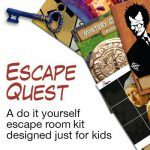 Yulu / Spy Code have a range of games aimed at children (Break Free, Safe Breaker and Operation: Escape Room), though you may struggle to find them at a reasonable price in the UK. 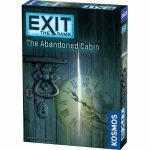 There are expansions / new games forthcoming for Unlock!, Exit, and Escape Room The Game. 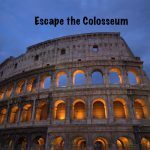 You might find something on Etsy too: there was previously a game called Conundrum by Coventry Road Games, and at time of writing there’s one called Escape The Arcade by CypherHouse. I haven’t played these, though you should probably expect anything here to be more handmade than the main commercial products, and to exist for a limited run only. Shipping from the US increases the price significantly, of course. IDventure is a German site that offers a variety of resources for creating a home escape event including an online game creation tool and a set of finished games (see our review of their Sherlock game). 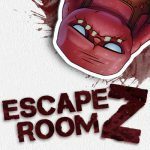 Journal29 is a remarkably good puzzle book game that is close enough to an escape game that anyone reading this page will probably enjoy it. Also worth mentioning is The Librarian’s Almanaq, which is definitely a puzzle book not any kind of home escape game, but which might appeal to enthusiasts – though be warned, it’s much tougher than most of the games above, and also starts by requiring you to tear several dozen pages out of the book. The Maze of Games is a puzzle book / novel hybrid that I haven’t tried but which looks like it deserves a mention here too. There are many excellent computer game versions of the genre, with particularly good starting points being The Room series and the Rusty Lake series; and for something closer to a play at home LARP murder mystery game, take a look at Freeform Games. I haven’t tried Cryptogram Puzzle Post but it appears to be a subscription-based puzzle / story-telling hybrid. Mysterious Package Company‘s experiences don’t involve puzzles, but might be of interest anyhow. The Black Letter Game also provide experiences by post, but with much higher puzzle quotient – though they don’t have anything for sale right now; and Dispatch seems to be a US-based story-driven puzzle experience by post. Any glaring omissions? 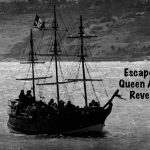 Let me know by commenting below or emailing escapethereview@outlook.co.uk.